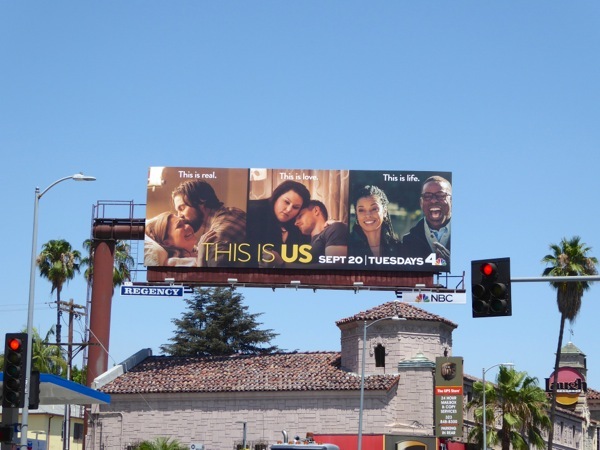 NBC's This Is Us has the distinction of being the first new Fall TV season outdoor ads to be spied by Daily Billboard on July 26, along Sunset Boulevard. 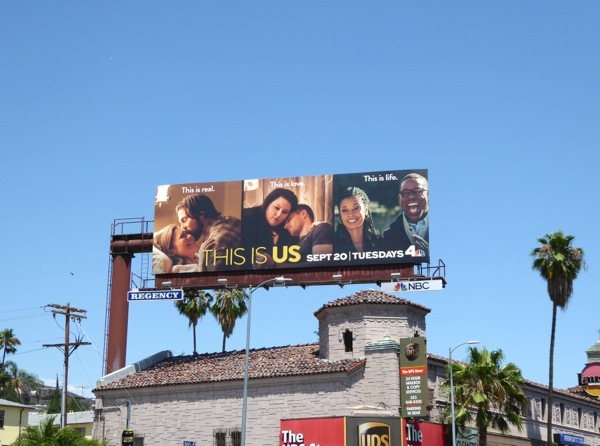 Extra support for the comedy drama was later spied along Melrose Avenue on September 6, 2016. The show follows a group of different people who all have different lives but share the same birthday. Milo Ventimiglia and Mandy Moore play the typical beautiful young married couple expecting triplets when her waters break on his birthday. 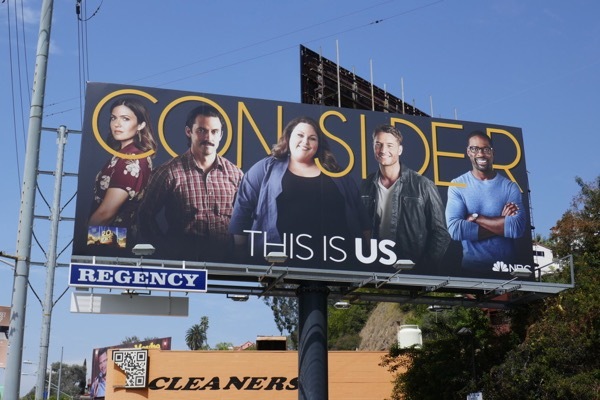 Justin Hartley plays a TV star bored with his career and life, whilst his twin sister, played by Chrissy Metz, struggles with overeating, and Sterling K. Brown's successful business man, married with kids to Susan Kelechi, decides to confront the father than abandoned him 36 years ago. Sounds like a lot to process right? But fortunately the series is brought to you by the writer and director that also weaved together the interconnected lives in the highly underrated 2011 movie, Crazy, Stupid, Love. 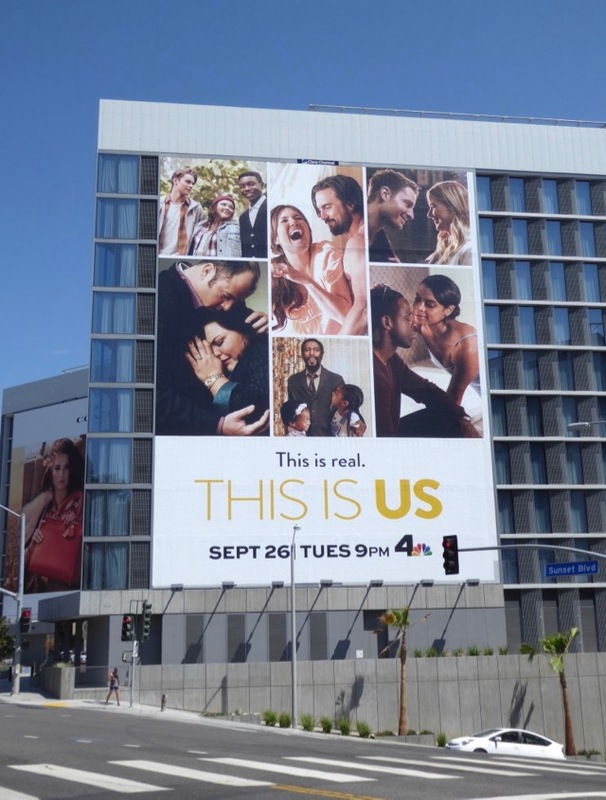 It's nice to see NBC trying something a little different this season and not relying on stealing other networks ideas, rebooting and remaking classic films and shows, or spinning off even more franchises from their Chicago-based TV series. The real question with all these fresh TV shows debuting though, is which unlucky series will be the first to be cancelled. 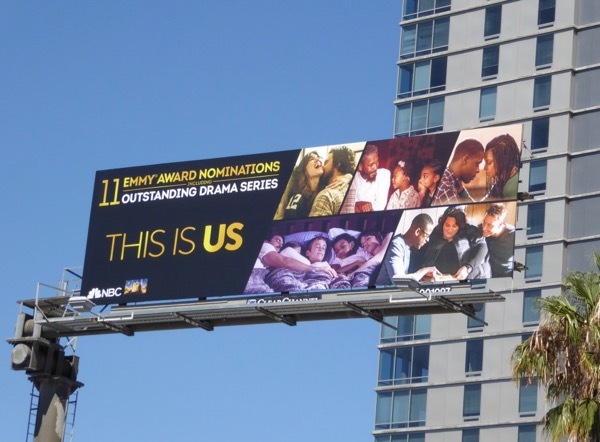 UPDATED: Here's also an Emmy consideration billboard for NBC's hit time-jumping drama with heart. 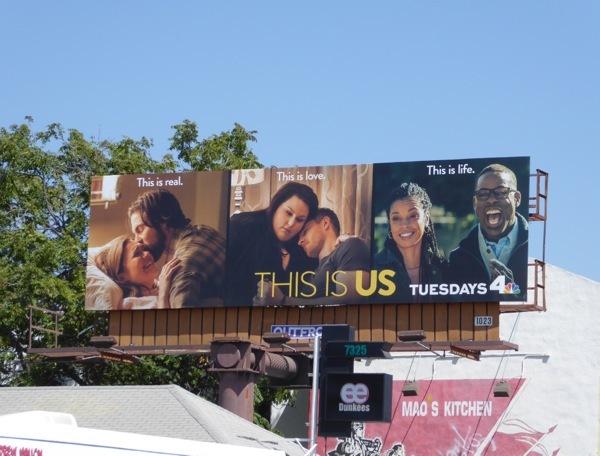 This ad creative featuring the diverse cast of all ages was snapped along Pico Boulevard on June 9, 2017. 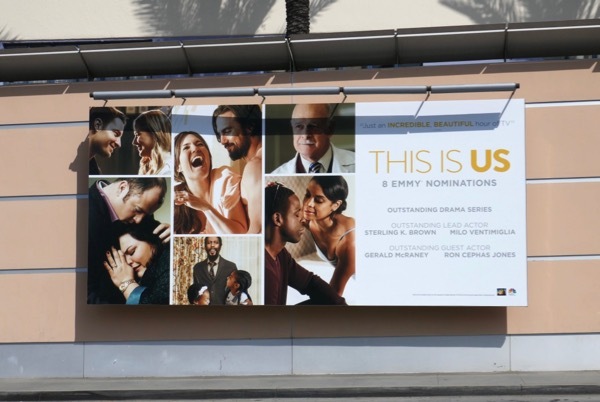 UPDATED: Here's also an Emmy nominations billboard for the freshman series snapped at Fox Studios along Pico Boulevard on August 5, 2017, although now it's only ten Emmy nominations as a costuming nod has been retracted due to the time period technicality of the episode. 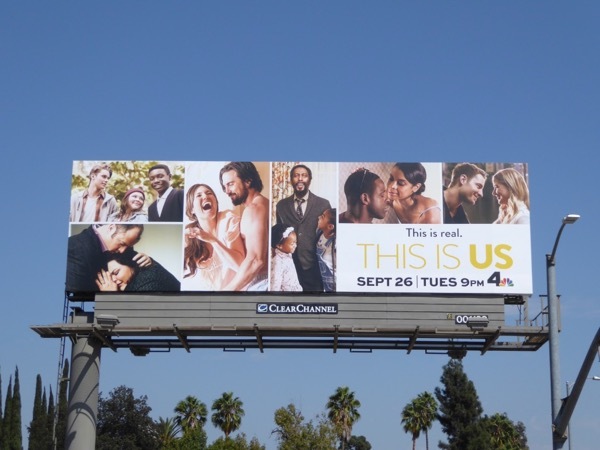 Plus Dan Fogelman's emotional drama may be filmed at Fox Studios, but NBC where it airs really wants Television Academy voters to take note of their breakout show with this giant billboard spotted along West Hollywood's Sunset Strip on August 8, 2017. We think commuters may have gotten the message with this super-sized composite ad creative. 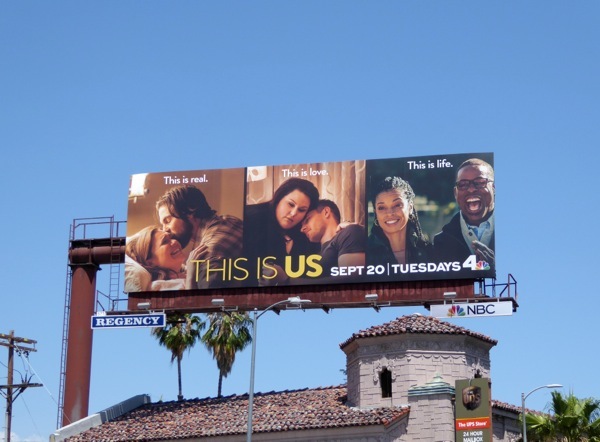 In addition these other landscape Emmy nominations bulletins for This Is Us were spied above Fountain Avenue and Sunset Boulevard the same day too. 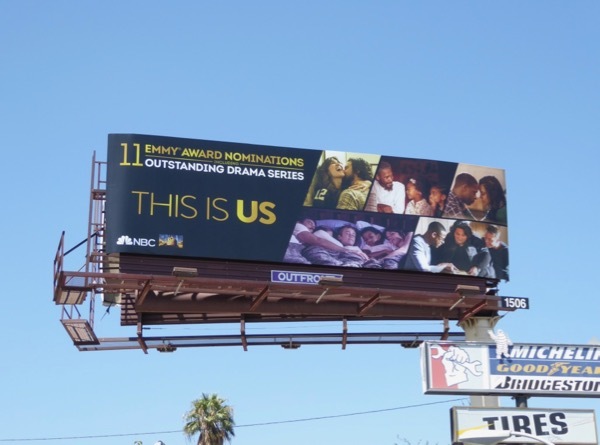 It may not have nabbed any of its three Golden Globe nominations, but let's see if This Is Us can take home a handful of its inaugural season Emmy nominations. 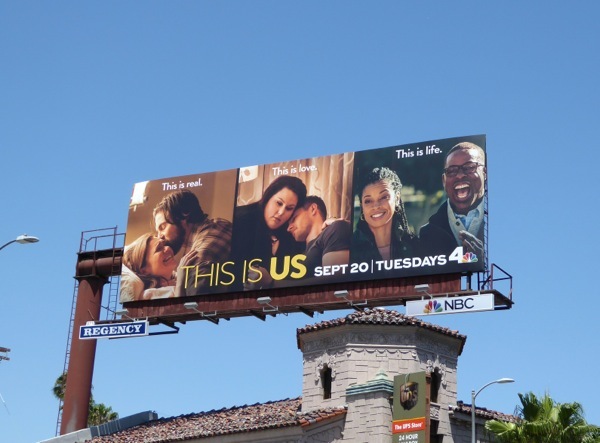 UPDATED: It looks like the super-sized Emmy nominee billboard for This Is Us was actually their sophomore season ad creative. 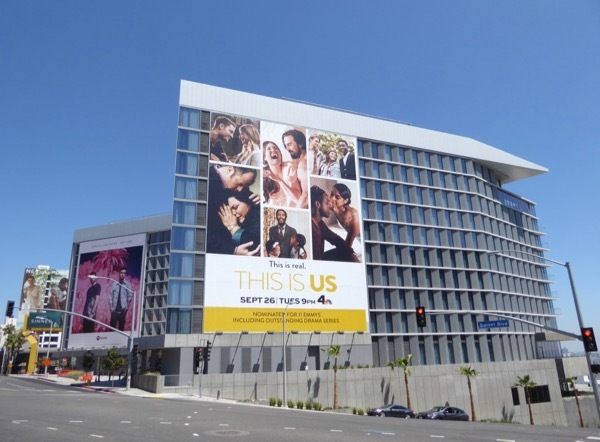 Here's a version without any mention of Emmys spotted in the same Sunset Strip location on September 5, 2017. 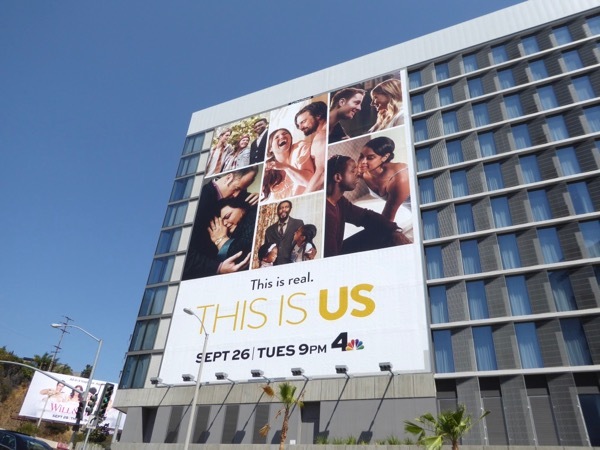 Plus here's also a standard landscape billboard snapped along La Cienega Boulevard at Olympic Boulevard on September 8, 2017. 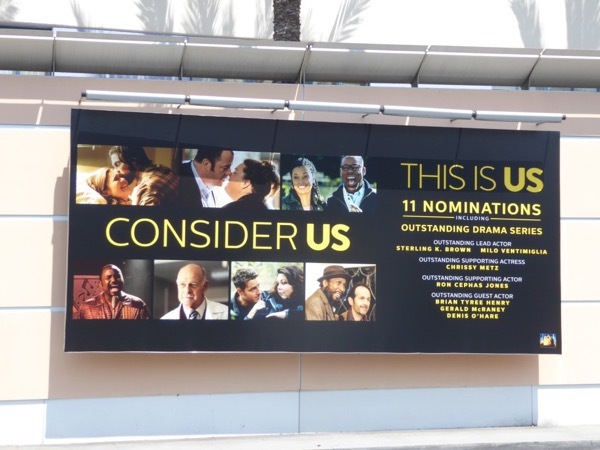 UPDATED: This Is Us garnered ten Emmy nominations last season and took home two awards for Sterling K. Brown as the grown 'Randall Pearson' and for Gerald McRaney for Outstanding Guest Actor as 'Doctor K'. 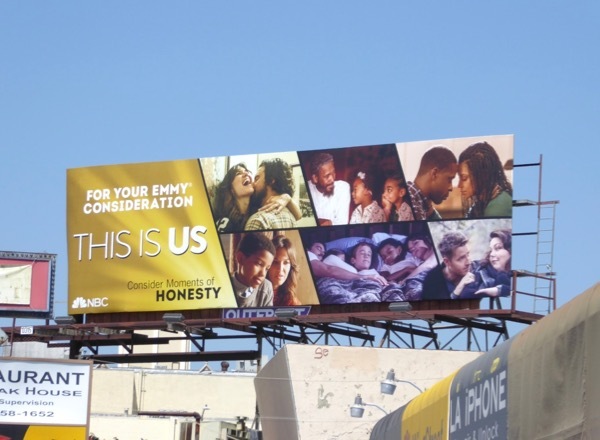 Let's see if this 'Consider' Emmy billboard, spotted along the Sunset Strip on May 29, 2018, will help the family drama's chances this year. 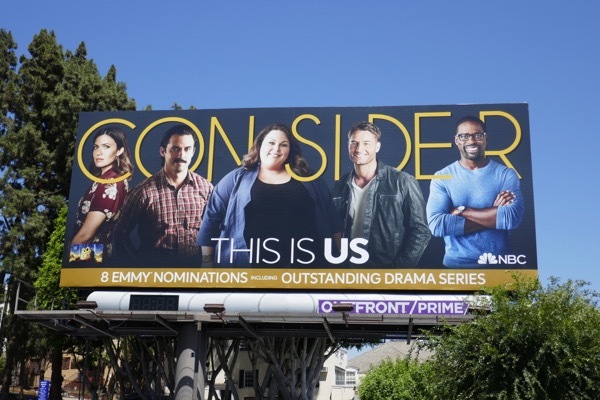 UPDATED: Congratulations to This Is Us for garnering eight nominations for its sophomore season including Outstanding Drama Series and Lead Actor nods for Milo Ventimiglia and Sterling K. Brown. 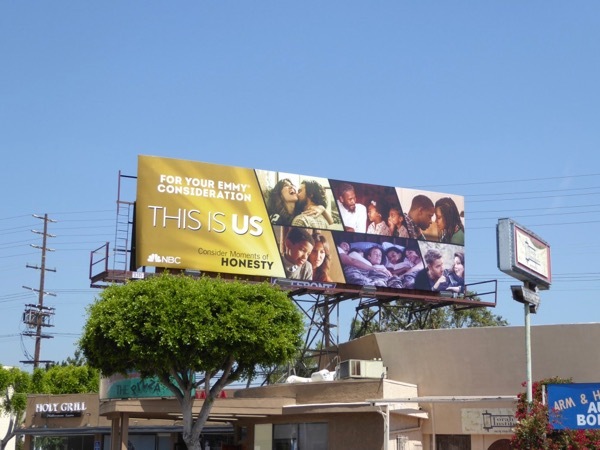 This Emmy nominee billboard was spied along the Sunset Strip on August 7, 2018. 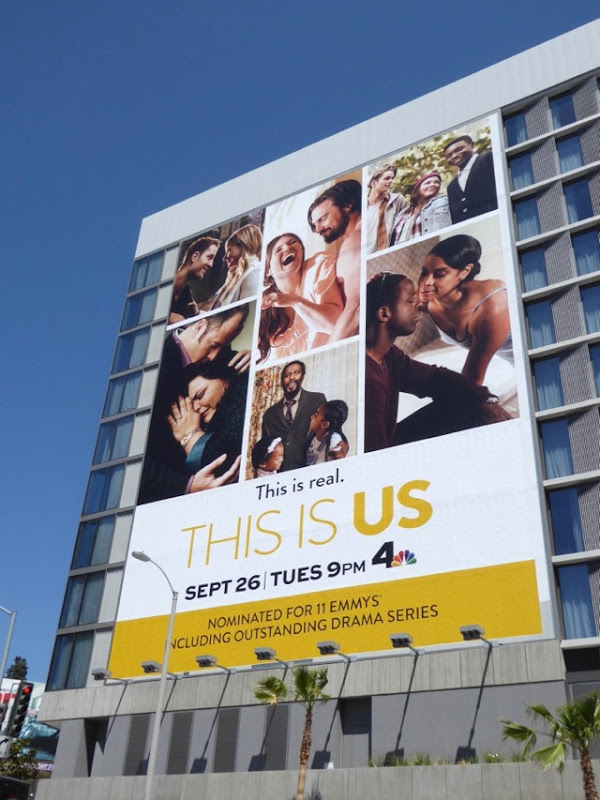 UPDATED: This Emmy nominee billboard was also spotted at Fox Studios (the production company for the drama) along Pico Boulevard on August 19, 2018.